Narsee Monjee Institute of Management Studies has acquired the shape of a multi-disciplinary University with a legacy of 37 years. It is one of the highly ranked management institutes in India. One of India’s premier business schools is the School of Business Management (SBM) of NMIMS, Deemed to be University (as per UGC Norms). 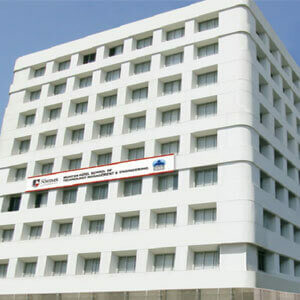 In the heart of the financial capital of India - Mumbai, the NMIMS campus was established in 1981. This is a Deemed to be University which is located in Mumbai. In various streams such as Engineering, Commerce, Management, Law, Pharmacy, Economics, Architecture, and Global Education, the University provides UG, PG and Doctoral programs. University conducts an entrance exam based on which admission to all the courses is given. University conducts NPAT for undergraduate courses, NMAT by GMAC for Management courses, and another exam for Ph.D.
NMIMS affiliated itself from the Mumbai University in 2003-04 and redefined its identity with a new logo. In 2004 ICL gave NMIMS the ISO 9001:2000 Certification and NMIMS is ranked 10th in the Asia Inc B-School Survey (South Asia Region). The School of Business Management, of NMIMS, Mumbai has received Global International AACSB Accreditation. The School of Business Management, of NMIMS, offers management programmes at its four campuses. These are MBA with specialization in Marketing, Finance, Information Systems, MBA –HRM, Operations & Decision Sciences; and MBA Pharmaceutical Management. NMIMS SBM has been ranked 4th amongst the top 10 Private S-Schools and 10th amongst the top 100 Management Schools in India by the Outlook magazine in the Outlook B-Schools survey October 2016. NMIMS SBM has been ranked 10th in Selection process and admission and 8th in Academic Excellence and Placements by the Outlook. The entrance test for admission to NMIMS SBM MBA programs, NMAT by GMAC is amongst the topmost accepted entrance exams. SBM-NMIMS has been ranked 8th among the top business schools in India by Business World C Fore B School Survey (November 2016). It has been Ranked 6th Best Business School, 2011 by Economic Times. National Assessment and Accreditation Council, (NAAC) accredited NMIMS with the highest rating of 5 stars in 1999. NMIMS was reaccredited with an A grade in 2006. In the heart of India’s financial capital, Mumbai, NMIMS School of Business Management was established in 1981. NMIMS exposes its students to industry interactions and interfaces that give its students a competitive edge over the others as it is situated in the financial capital of the country. The college provides ‘Luxurious’ infrastructure to students. The college has world-class infrastructure, and it is equipped with AC classes and rooms. A library at the NMIMS has a plethora of books and a repository of knowledge. The campus of NMIMS is truly and Extremely lavish and professional. All kinds of food are served at the canteen in the campus. As NMIMS is situated in the heart of the country, the students can get a chance to interact with the stalwarts and speakers from the industry like Mrs. Kiran Bedi, Mr. Roshan Abbas – TV Anchor/Director/Writer, Mr. Tarun Chugh – CEO/MD PNB Metlife, Mr. Sadashiv Nayak- CEO Big Bazaar, Ms. Vandana Kohli – Independent Film Director, Mr. Raghu Iyer – CEO Rajasthan Royals, and Mr. Sandeep Bakhshi – CEO, ICICI Prudential Life Insurance. The campus life at NMIMS is very exciting due to its events like ‘Saturday live’ and ‘Mumbai Darshan’ and fests like ‘Paragana’ (Business fest) and ‘Euphoria’ (Cultural fest). On the basis of candidates’ NMAT scores, they are shortlisted. For a round of Case Discussion (CD) and Personal Interview (PI), the shortlisted candidates would be called to NMIMS Mumbai. On the basis of their educational qualification and research proposal, candidates will be shortlisted. Shortlisted candidates will have to appear for NMIMS written Research Ability Test. This will be followed by a critique of a Research Manuscript and then they need to give Presentation based on SOP and Personal Interview. Candidate’s final Selection will be on merit. Candidates will be shortlisted based on their NMAT (200 and above)/Entrance Test /GMAT (600 and above) score. The shortlisted candidates will then have to face a round of Personal Interview and then only their admission would be finalized. For admissions to all the MBA Full-Time courses at NM Mumbai and all the PGDM courses at NM Hyderabad, Bangalore, Indore, and Navi Mumbai, NMIMS considers candidates for admission based on its own exam, NMAT. A candidate is allowed to attempt the exam three times, in a window of 75 days. For the final admission, the best of three scores would be accepted by the institute. Eligibility for MBA programme is Full Time Bachelor’s Degree (10+2+3) in any discipline from a UGC recognized University with minimum 50% marks in aggregate in the first attempt. Candidates who have appeared for final year examinations can also apply, but their admission will be subject to obtaining a minimum of 50% marks in the qualifying examination. For EMBA, in addition to full-time graduation from a recognized university, a minimum of 5 years of work experience in an executive or supervisory capacity only is required. For Part-time MBA, in addition to full-time graduation from a recognized university, a minimum of 2 years of work experience in an executive or supervisory capacity only is required. The campus of NMIMS, SBM is located very close to the domestic airport and is close to the business district and corporate houses. The building has 60 plus classrooms and it is a 10-story building. There are also conference rooms and offices for placement, examination, marketing, academic administration. This 3,50,000 square feet campus aims to enhance students’ learning experience and provides the latest learning technology tools. All classrooms are in semicircular shape with plenty of room for class discussions and faculty and student interaction. The classrooms and campus are equipped with Wi-fi, video streaming, and video conferencing facility. For group activities and team exercises, every floor has a student lounge. The whole campus is air-conditioned and provides the students with a large cafeteria and recreational facilities. This is the first Indian educational institution to introduce SAP (System Application and Products for Data Processing) for its academic administration. Resource Centre of the institute is spread over 15,000 sq.ft. which has a rich collection of books, audio-visuals, journals (National/International), annual reports, CDs, VCDs, newsletters, management games, etc. and it is well-furnished and air-conditioned. The Resource Center has a collection of more than 50,000+ books which covers all aspects of business and management as well as includes related areas like Law, Engineering, Economics, Behavioral Sciences, IT, etc. The hostel facility of NMIMS includes two full-fledged hostels and five rented residential accommodations in Mumbai, separately for boys and girls. Both the hostels are well equipped and have excellent infrastructure. The hostels contain every required facility from Gymnasiums to Table Tennis and facilities for many other sports. The hostel food is also of good quality and is affordable. NMIMS always experiences excellent placements. More than 150 companies visit the campus every year and offer a variety of top profiles to the students of the various NMIMS MBA programs. A total of 172 companies visited the campus in 2018. The Highest Stipend for MBA was INR 3,00,000 and for MBA HR it was INR 2,00,000. The highest salary for MBA for 2018 batch was Rs.30.60 Lakhs/annum, average package received was Rs.17.6 Lakhs/annum and it was Rs.18 Lakhs/annum for MBA HR for the same batch and average package for MBA HR was Rs.14.13 Lakhs/annum. Every year the very first batch is placed for an internship with the top names in their respective industries. Birla Cement, Oberoi Realty, L&T, Indian Oil Corporation Ltd, Reliance Industries, Raymond Ltd, State Bank of India, Tata Capital, BSE, HDFC Bank, Anand Rathi, Bank of India, Kotak, Avanse Financial Services, India Nivesh, NSE, Zee Media, Ogilvy & Mather are some of the cherished recruiters of NMIMS, SBM.